Petrox EC combines the benefits of a superior surfactant and oil-metabolizing microbes to remove oil from surfaces without increasing slipperiness. Petrox EC is used for industrial maintenance to remove various cutting, lube and fuel oils that accumulate during normal operations. Detergent cleaners leave a film on the floor that increases the potential slip hazard to workers and customers. Petrox EC is a non-detergent cleaner that removes the oil without leaving behind a soapy film. As an added benefit, Petrox EC contains microbes that continue to breakdown the oil that has penetrated pores in the floor for a longer lasting treatment. The following photograph shows side-by-side comparison of the benefits of Petrox EC over detergent cleaners. 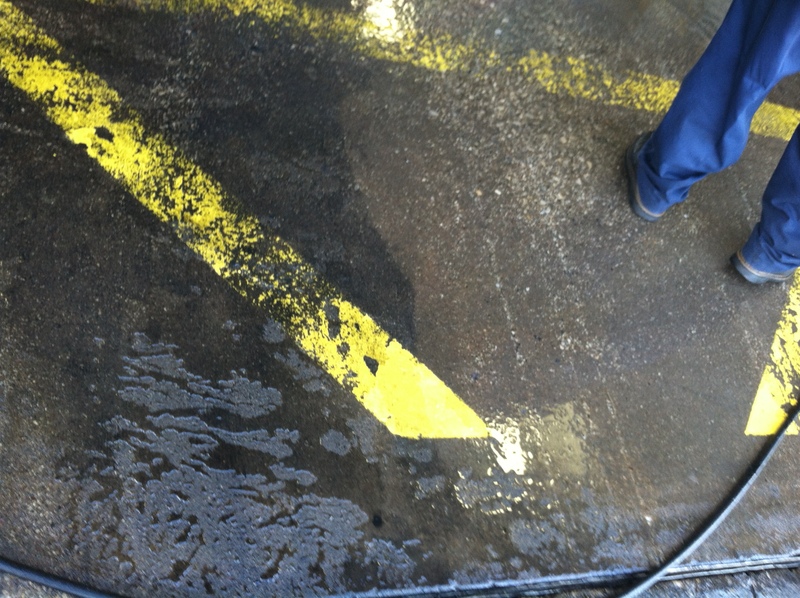 The Petrox EC treated area on the right-hand side of the photograph shows better oil removal and no water beading on the surface. Cl-Out bioremediation was used to remove PCE from ground water at a dry cleaners in Vermont. CL-Out micorbes were selected for bioremediation of the site because they are compatible with the natural aerobic aquifer conditions. One application of CL-Out bioaugmentation reduced the PCE concentration by 90% in less than 6 months without increasing the vinyl chloride concentrations. The following table summarizes the process of aerobic cometabolism of PCE. The pre-bioaugmentation sampling showed aerobic conditions and a low population of Pseudomonas microbes. 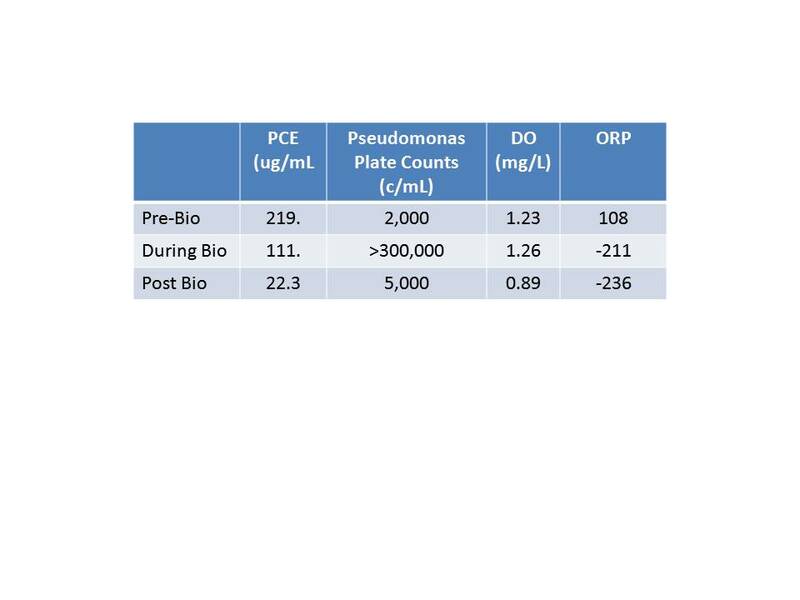 After bioaugmentation the Pseudomonas population was higher. 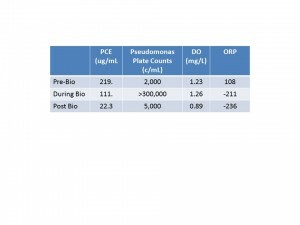 As the microbes consumed the dextrose substrate and produced the oxygenase enzymes necessary for PCE destruction, the ORP and PCE concentrations decreased. Six months after the bioaugmentation, the microbial population returned to the pre-bioaugmentation conditions. Petrox EC is a product that combines a surfactant with petroleum-degrading microbes to improve separate phase oil recovery and bioremediation of residual oil. The combined approach improves the rate of oil removal from soil and other subsurface media and establishes a beneficial petroleum-degrading microbial population that will treat tightly bound or deeply penetrated oil. Petrox EC has been used in combination with periodic LNAPL extraction by pumping or bailing. In field applications the surfactant effect has increased the LNAPL recovery rate by more than 10 fold. Petrox EC has also been used to improve the efficiency of air sparging by flushing oil from the sediment surface for sparging and vapor phase recovery. The success of bioaugmentation depends on effective distribution of the beneficial microbes. If the target population is achieved, the remediation rate ranges from 50% to over 99% removal. The rate appears to be independent of the contaminant starting concentrations. This indepedence is the advantage of bioaugmentation. Through bioaugmentation the density of beneficial organisms is sufficient for frequent reactions with high or low contaminant levels. 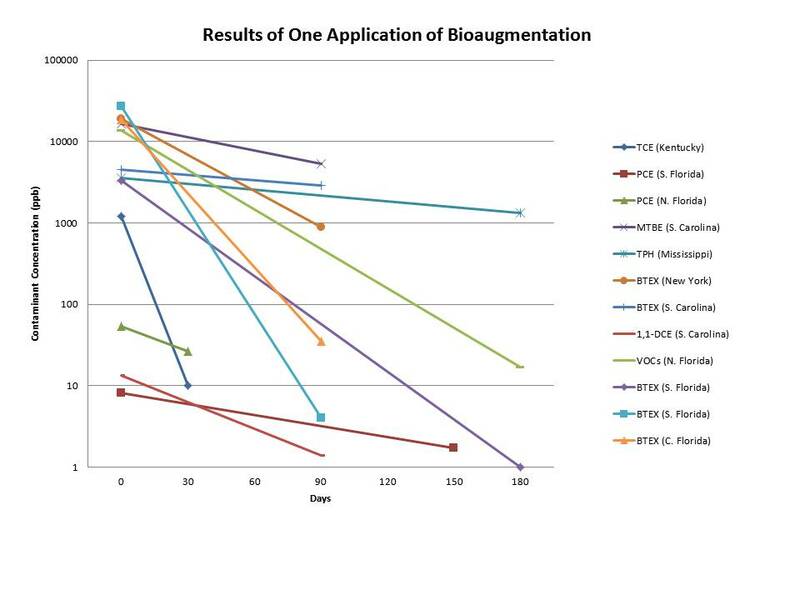 The following chart shows the results of a single application of bioaugmentation at 11 sites in different states, with different contaminants. The chart also suggests that the results are not time dependent. The apparent time independence may be because the reactions are completed early and because these were grid applications with the monitoring locations within the bioaugmented area instead of downgradient where the results would depend on dispersion rates. By switching from active extraction to in situ CL-Out® bioremediation, In Control Technologies, Inc. of Houston, Texas saved their client $100,000s in on-going operation and maintenance costs. The Site was a shopping center where soil and ground water were contaminated by dry cleaning chemicals. A dual phase extraction system was installed and operated for 9 years. The dual phase system reduced the total CVOCs by 70%, but the contaminant removal rate reached the limit of cost effectiveness. Irwin Engineers, Inc., of Natick, Massachusetts has undertaken a similar approach to reduce on-going pump and treat remediation costs at a site of perchlorate contamination. Irwin Engineering presented that case study at the AEHS Soils, Sediment, Water and Energy Conference (2013).